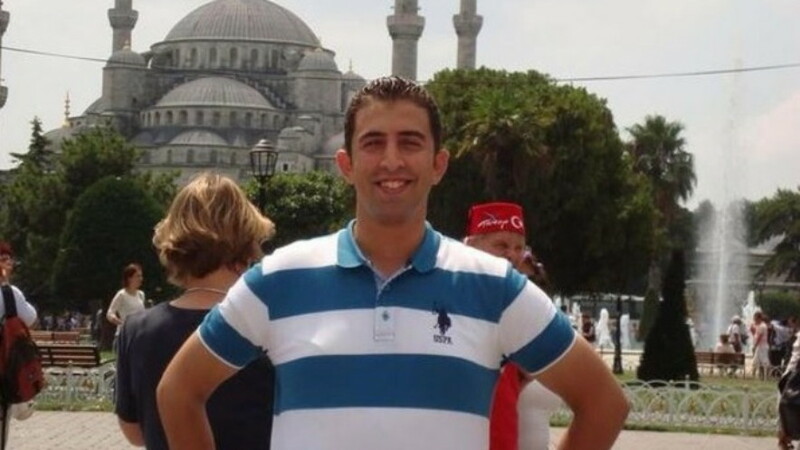 Royal Jordanian Air Force pilot Lieutenant Moath Youssef al-Kasasbeh was murdered by the Islamic State. 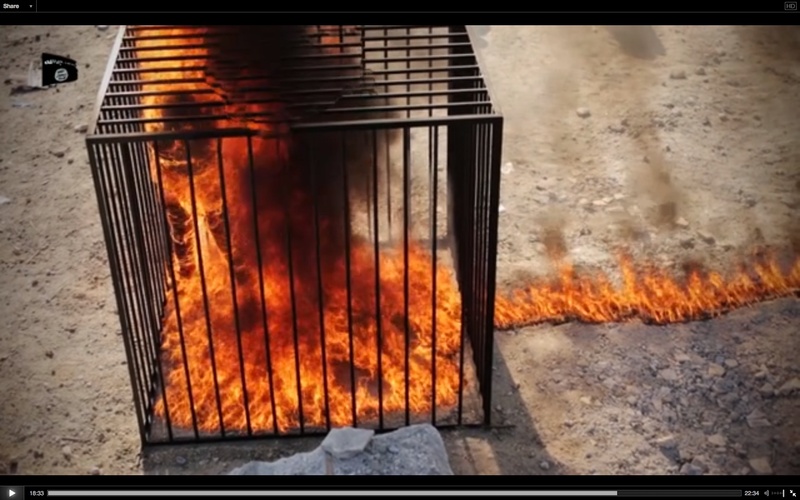 However, the video they released of Lieutenant al-Kasasbeh’s murder—freakishly titled “Healing the Believers’ Chests”—proves beyond all doubt that he was not burned alive. 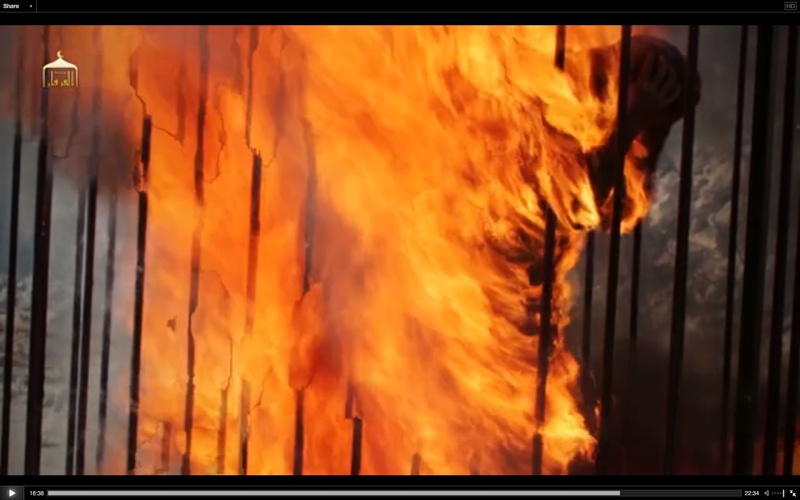 The flames are computer-generated imagery (CGI). I had initially intended to not watch the video, but the screen grabs I saw made me suspicious. Therefore I watched a low-quality version, which confirmed what I’d suspected. After much searching I found a very high-resolution video. An automated Twitter window cautioned that the site linked above is somehow nefarious, but the warning wasn’t specific. My anti-virus software says the site is safe. 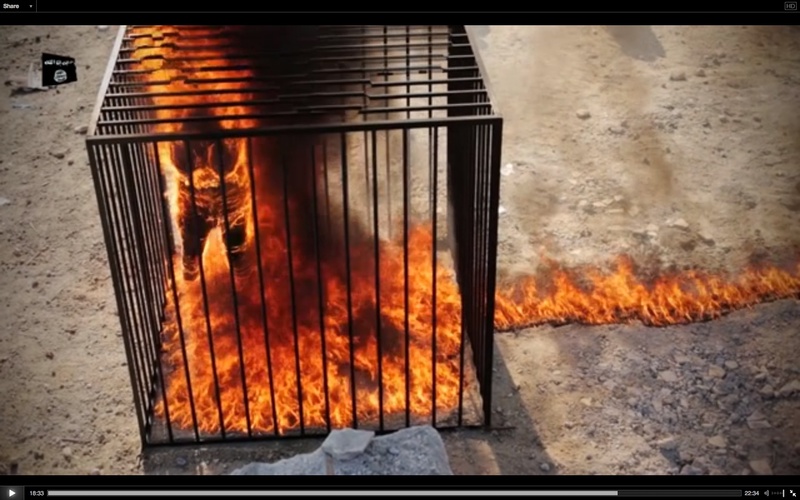 If you decide to watch the video, I PROMISE YOU THAT LIEUTENANT Al-KASASBEH WAS NOT BURNED ALIVE. He was shot in the head after he mimed being burned alive. If you stop the video at 18:50, you will have seen nobody die. 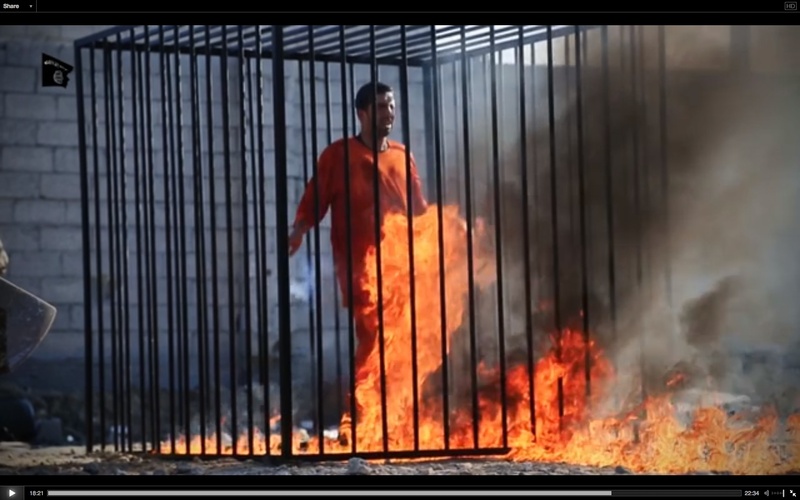 At 18:52 is the burned corpse of Lieutenant al-Kasasbeh, whose body was doused with gasoline and burned postmortem. 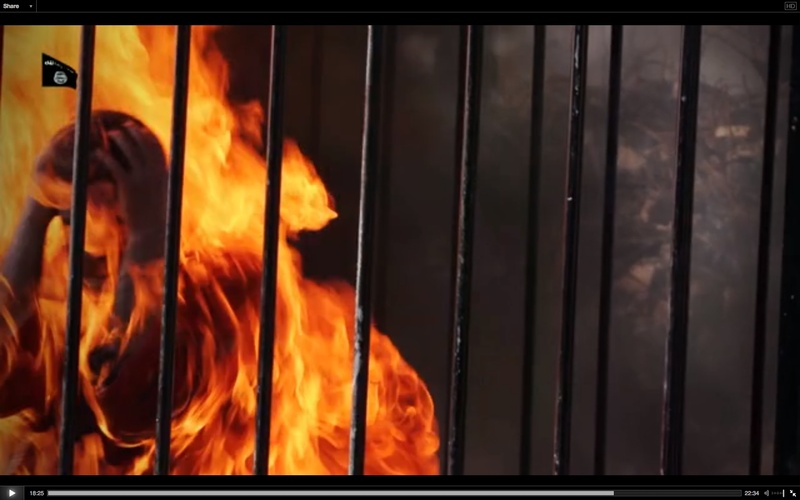 Why would the Islamic State have a prisoner mime being burned alive? Because if you set someone on fire, you can’t be sure of what they’ll do. 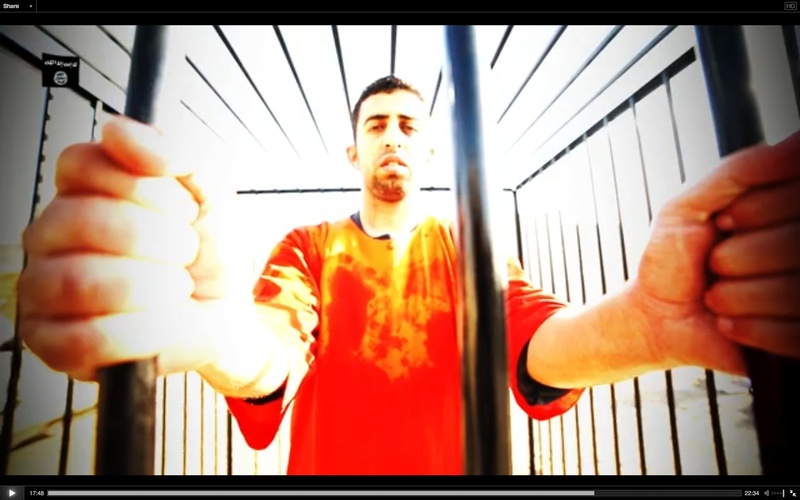 The terrorists wanted Lieutenant al-Kasasbeh to walk around in a penitent posture, and then fall to his knees. They couldn’t risk him fighting back or knocking over the cage. After the performance, while he was still on his knees, someone approached him—probably congratulating him and reassuring him—and that man shot him with a pistol on the right side of his forehead. It’s important to debunk this propaganda, because the terrorists use it to recruit and to instill fear. Hopefully I can also bring a slight amount of comfort to the family and friends of Lieutenant Moath Youssef al-Kasasbeh. HE DID NOT DIE THE WAY THAT THE ISLAMIC STATE CLAIMS. I won’t show you anything gruesome, except for two photos of Lieutenant al-Kasasbeh after he was shot. The thumbs are tiny so that you don’t have to see them, but they contain the irrefutable evidence that I’m right. 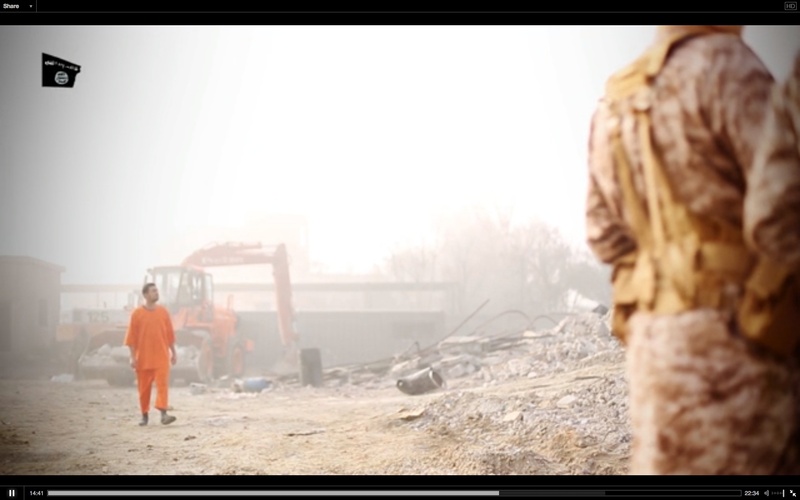 It’s clear that Lieutenant al-Kasasbeh’s every movement is choreographed by a director. Once he’s in the cage, his clothing is stained with what we’re supposed to think is combustible liquid. The torch is made of excelsior or “wood wool,” wooden slivers used in packing. When lit, wood wool turns black instantly. That “torch” isn’t on fire. The flames are CGI. I thought that this was a trail of accelerant. 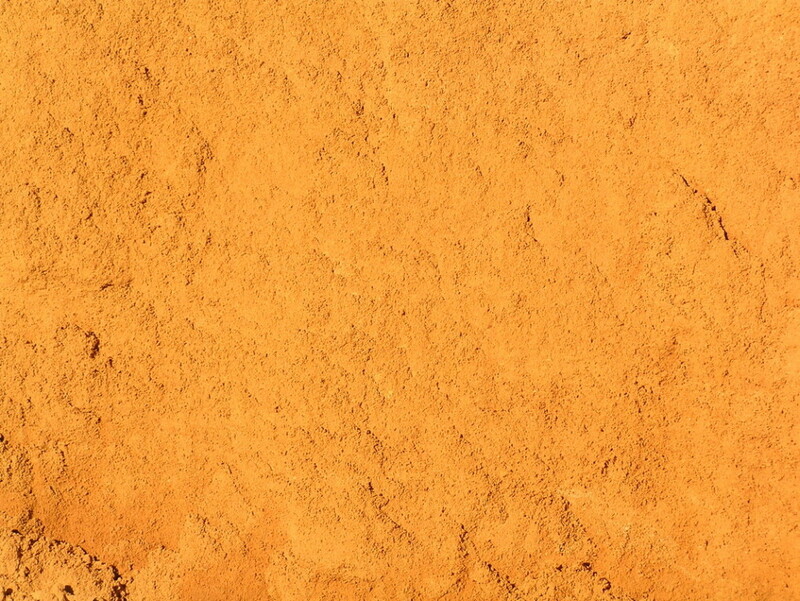 In reality it’s an inert material, probably “fatty sand,” also known as bricklayers sand, which comes in many colors. The “flames and smoke” are very bad CGI effects added in post production. On the ground inside the cage, you can see a square and an X made of bricklayers sand. They’re simply what’s known in the theatrical world as “spikes”—marks for where to put props and where actors should stand. 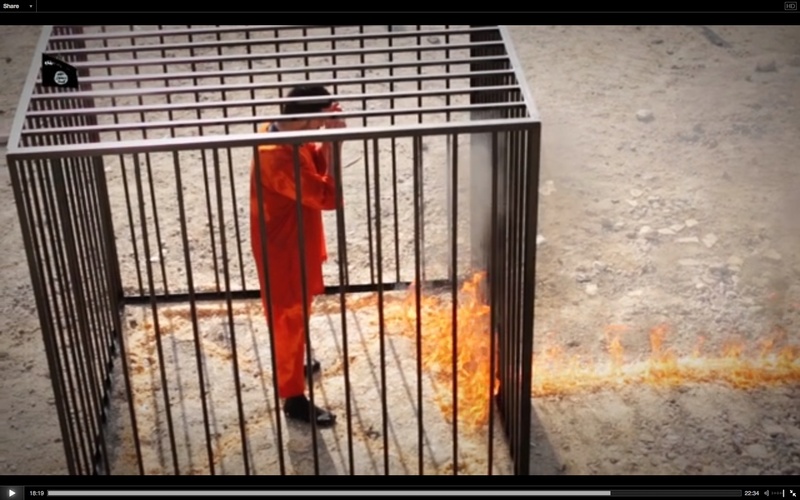 The square indicates where the cage should be, and the X is where Lieutenant al-Kasasbeh was told to stand. They aren’t made of an accelerant because they don’t burn. 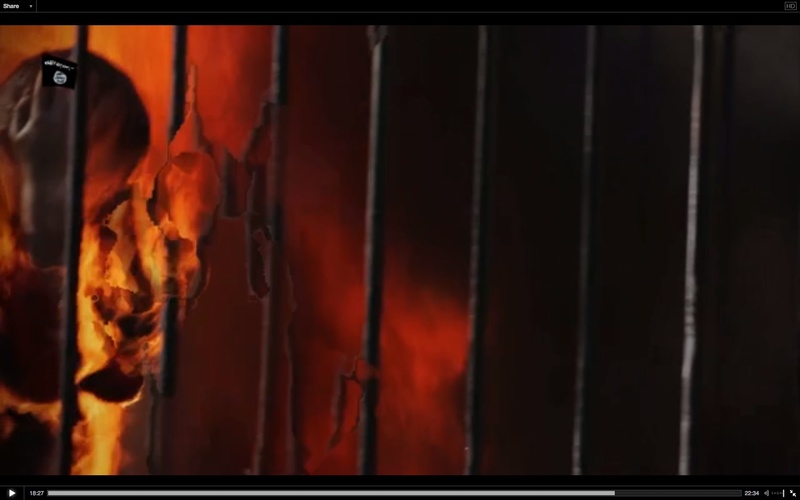 In this screen grab you can see the extremely unconvincing CGI flames (right). They’re made by an out-of-the-box computer program. 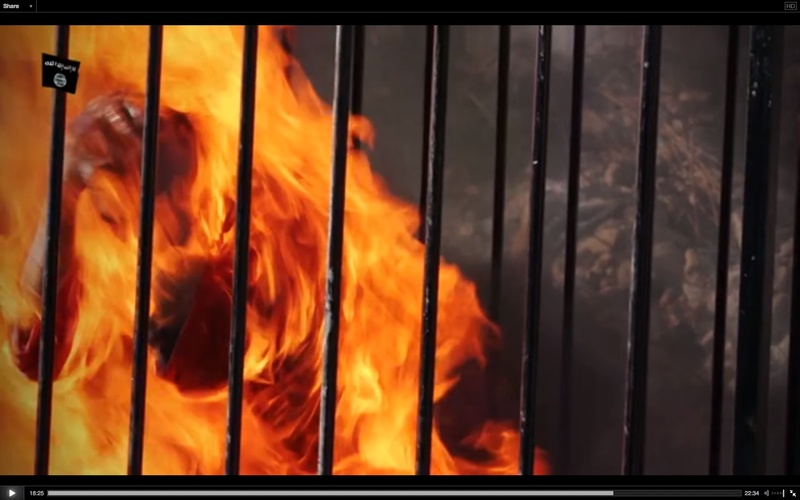 This is the moment at which Lieutenant al-Kasasbeh “catches fire.” I PROMISE THAT IT’S FAKE. How could he burn so quickly? There was no accelerant in the cage. 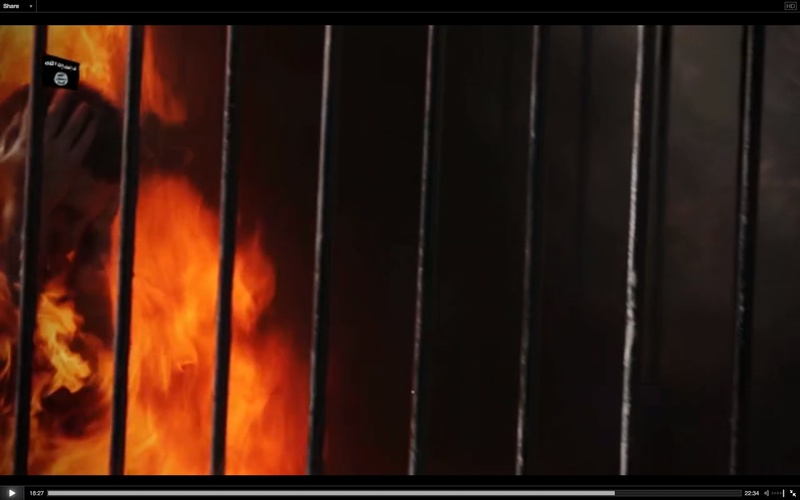 If that square and X on the ground had been an accelerant, there would be a curtain of flame all around the inside edges of the cage. And note the clarity of the figures in the background. Flames that large should give off heat waves that would distort all those men holding guns. The flames are therefore CGI. This looks awful, but it’s not real. Again, no heat waves, and the ground isn’t burning uniformly, as it would if that light-colored material were an accelerant. And note the truly abysmal quality of the CGI flames in the lower right. They look like spaghetti with tomato sauce. Now we begin to see the inarguable proof that this is a hoax. 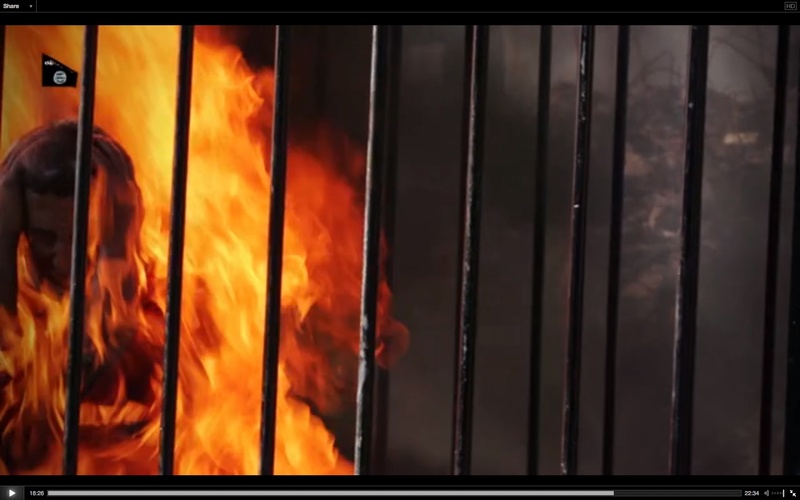 Though he’s engulfed in roaring flames, Lieutenant al-Kasasbeh still has a full head of untouched hair, his skin is not even slightly injured, and his clothes are not burning despite having been soaked in gasoline or diesel oil. I debated whether or not to post a video of a Sri Lankan monk burning himself to death after dumping a can of gasoline on his head, but I decided that the images above should be enough. You don’t need to see the real thing to know that this is phony. Lieutenant al-Kasasbeh would’ve lost his hair by now, and his skin and clothing would’ve begun falling off in tatters. Here’s where the CGI breaks down. A professional videographer confirmed to me that this is the result of CGI gone out of control. 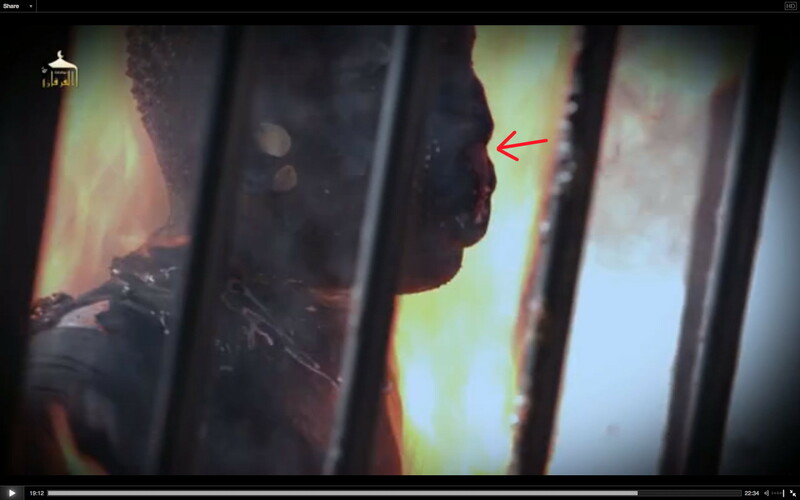 The FX (effects) guy was sloppy because he knew that no media outlet would actually analyze the video. The press is no longer in the fact-checking business. Another major CGI malfunction. The left side of the screen resembles shattered glass. The view from above contains numerous pieces of evidence that the flames are CGI. For one thing, the bars on the top of the cage follow the tower of flame and smoke upward, like the moving steps of an escalator. This anomaly is present in the original video. 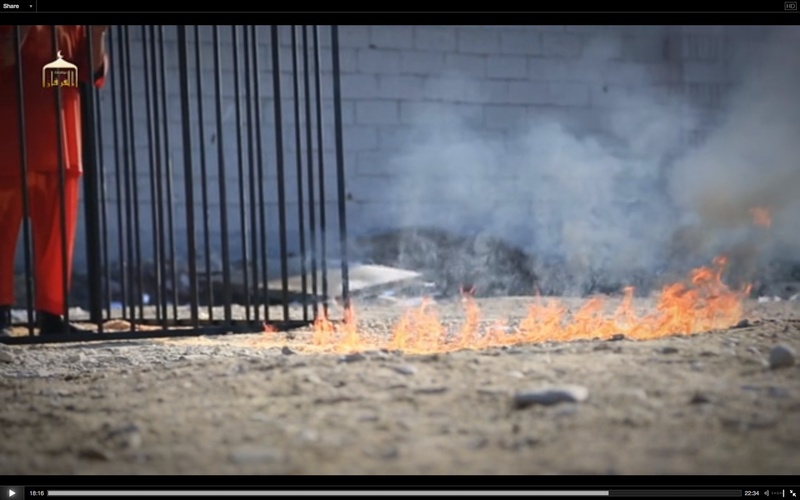 Note that the trail of “accelerant” leading to the cage is now deep orange. 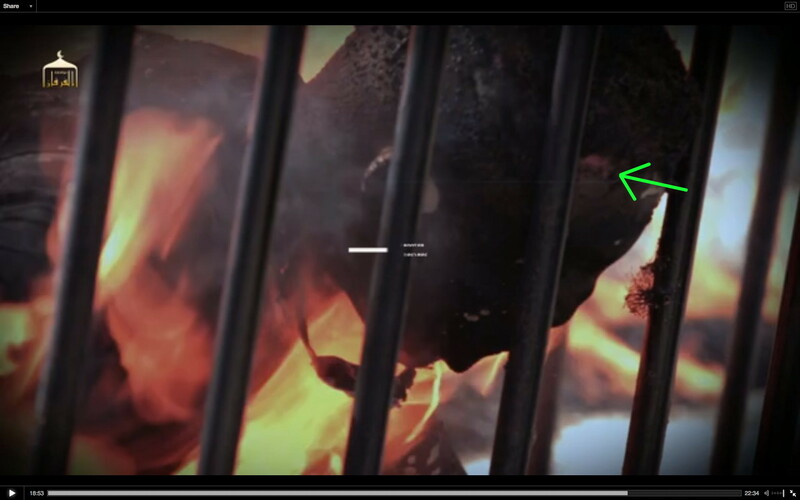 However, none of the flames and smoke in this section of the video cast shadows. And remember, there was no accelerant in the cage. What’s burning so fiercely on the ground? 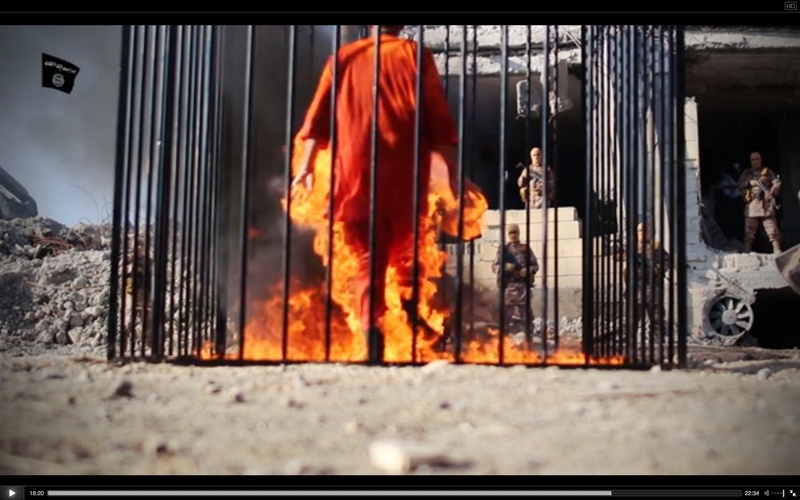 Lieutenant al-Kasasbeh has become a man of fire, utterly consumed from head to toe. Yet no shreds of clothing are dropping off. Now some outstanding Islamic State carelessness. Despite being a living torch, Lieutenant al-Kasasbeh has still not suffered any injury to his skin. Look at his forearms and hands. And his hair is still intact. In both photos above, the broken-glass effect of cruddy CGI is clearly seen. When Lieutenant al-Kasasbeh sinks to his knees, the skin on the back of his neck is unharmed, and he has all his hair. Under the threat of death, and almost certainly told that he’d be spared if he cooperated, he did what the director told him to do and pretended to be burned alive. I apologize for these. You don’t have to look at them, since I’ve described them in detail. After Lieutenant al-Kasasbeh finished his miming his death, he remained on his knees. Someone approached him, smiling and promising salvation. This man shot Lieutenant al-Kasasbeh in the right side of his forehead, undoubtedly using a small-caliber pistol. The terrorists wanted him in his kneeling posture, so they took him by surprise. His last emotion was probably relief; he had no time to be afraid. The wound is marked by the green arrow. When a person suffers third-degree burns, the skin turns black or white. That pink wound is a bullet hole. I know that Lieutenant al-Kasasbeh was shot in the head, because as his body fell backward, liquid streamed from his nose. A bullet fired downward into his forehead would’ve pierced his sinuses. 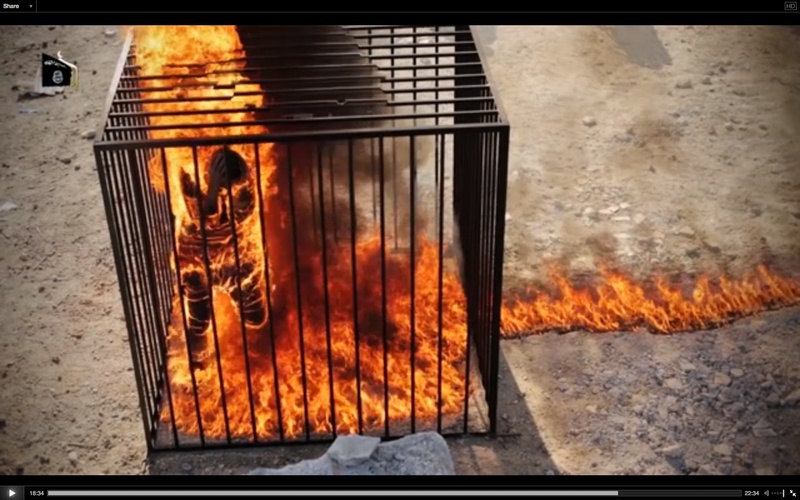 There’s no need for me to post photos of Lieutenant al-Kasasbeh’s body after it was burned. 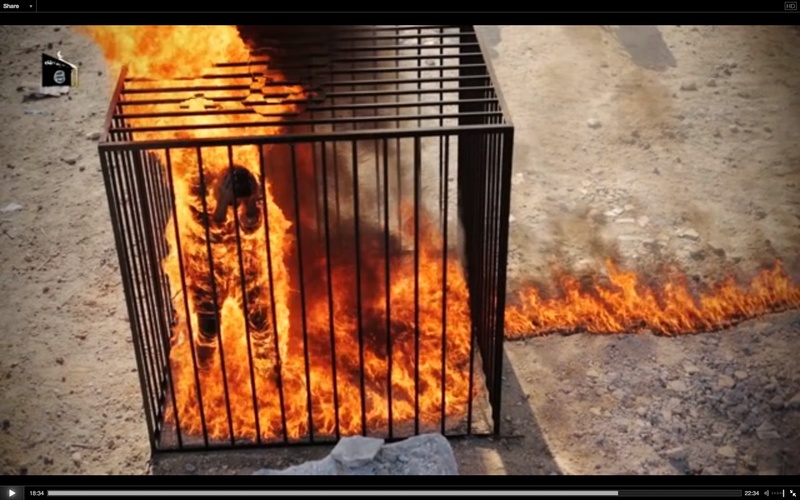 However, you should know that his arms were held away from his sides, indicating that the terrorists tied his wrists to the cage bars to keep him upright, doused him in gasoline, and set him on fire. His nose was also broken, probably from when his face slammed into the cage after he was shot. But he was already dead when all of this happened. Don’t let the Islamic State fool you. Not only did they produce a transparently false propaganda video, every man seen close up in this grisly production can be identified though facial-recognition software. 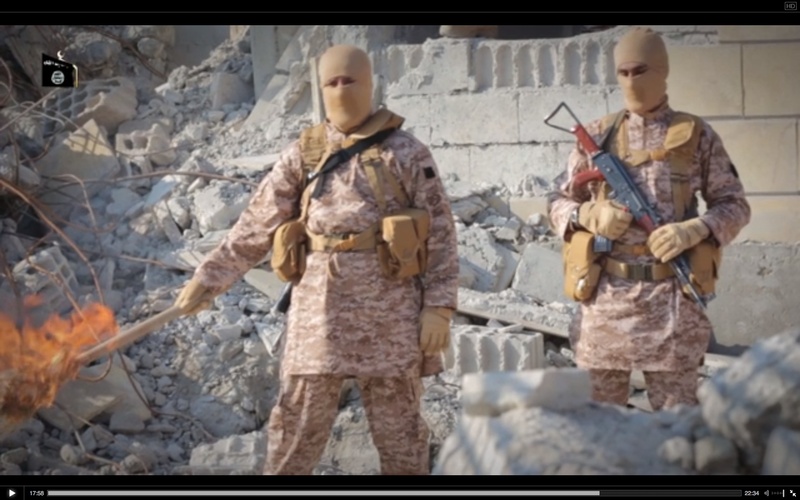 The Islamic State assisted by wearing tight balaclavas. Say a prayer for the soul of Lieutenant Moath Youssef al-Kasasbeh. He was a brave man who volunteered to save people he didn’t even know. 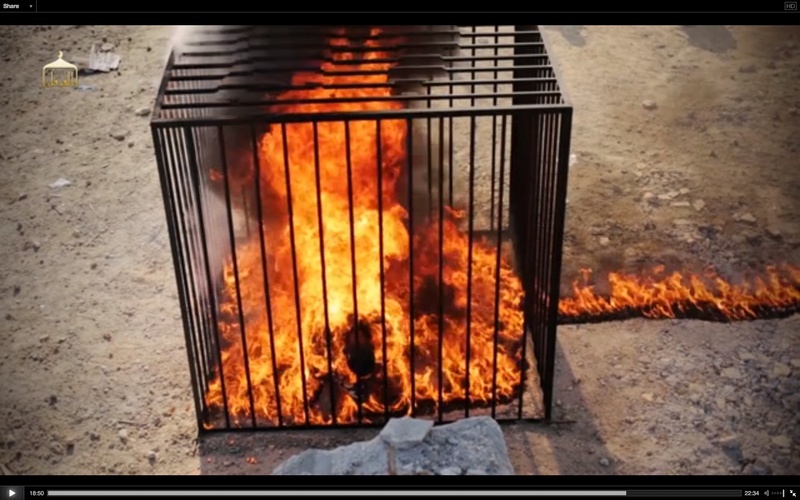 The Islamic State has released more footage that proves Healing the Believers’ Chests is fake. Click here for further proof that Healing the Believers’ Chests is a hoax. 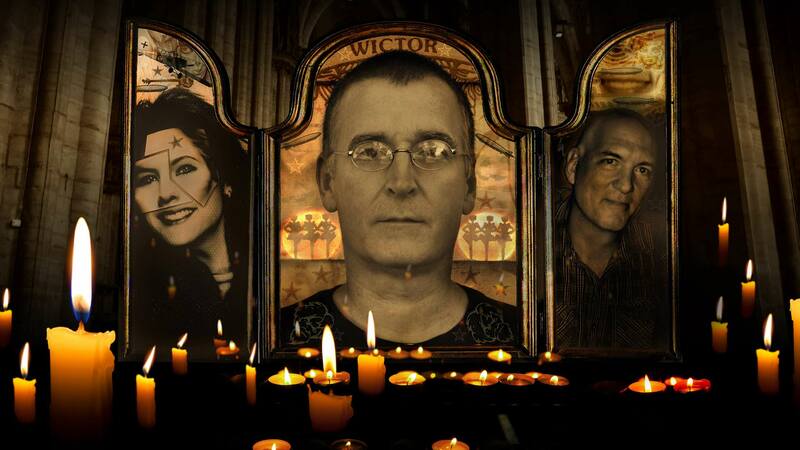 Click here for WHY the Islamic State faked Healing the Believers’ Chests. This article viewed 326042 times.